Don’t Waste Your Perfect Human Rebirth! 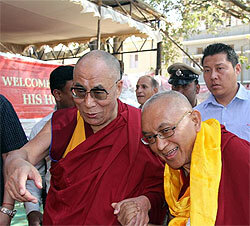 His Holiness the Dalai Lama and Lama Zopa Rinpoche at a public talk in Bangalore, India, January 2011. Photo by Tara Melwani. We Welcome Three New Study Groups! For more information as it becomes available please go to Rinpoche’s Schedule. For details of how to register for these events please contact the relevant center directly. “I am the famous blind turtle. I have been trying to get the opportunity for my neck to go inside the famous golden ring for numberless eons, [and] still it has not happened, [not] even one time. perfect human body, have met the Buddhadharma – it’s really like a dream, very hard to believe, don’t waste it even for one second, please work for enlightenment, practice bodhichitta. 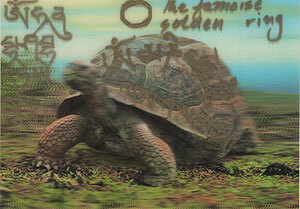 The turtle is saying, ‘I don’t know where the golden ring is? I can’t see, but what I have heard is that the essence of the whole entire Buddhism is to develop compassion, to bring all sentient beings to full enlightenment. This mantra on my shell, just by seeing [it] you can achieve full enlightenment. I carry this on my back all over the ocean, enlightening others, at least the other turtles, as well as all sentient beings including my enemies, who eat me, who harm me. PS: The mantra beside the turtle – each time by seeing this mantra purifies 100 million eons of negative karma. His Holiness with Rinpoche and members of Tushita Mahayana Meditation Centre, January 2011. Please rejoice as this is the 20th year that FPMT has been offering food to the monks at Sera Je Monastery. To date, the Sera Je Food Fund has provided over 15,000,000 meals. That’s 2,500,000 meals per year; 7,800 meals every day. 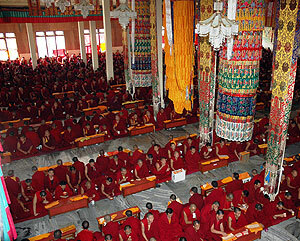 In January 2011, FPMT was able to send US$129,997.94 to Sera Je Monastery. This contribution covers the next six months’ worth of meals (we are now offering three meals per day) for all 2,600 monks currently studying at Sera Je. Thank you to all the kind benefactors who support this amazing project and please rejoice in this incredible offering that we are able to make to the Sangha, our future FPMT center geshes and to “the pores of the guru,” other disciples of His Holiness the Dalai Lama. 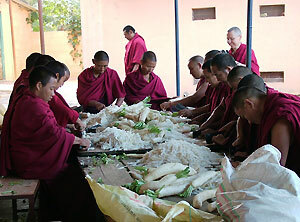 FPMT has provided over 15,000,000 meals to Sera Je monks since 1997. The 2,600 monks from Sera Je receive three nutritious meals everday because of the generosity of hundreds of people. I would like to thank some of the centers who are creatively supporting FPMT charitable projects: Land of Medicine Buddha is offering 10% of their Dharma income to Amdo Eye Center; Institut Vajra Yogini offered 10% of their membership income to the Sera Je Food Fund and Kopan Monastery; Yeshe Norbu Appello per il Tibet has for many years raised funds for Sera Je Food Fund; and thanks also to Cham Tse Ling, Amitabha Buddha Centre and Losang Dragpa Centre for their kind support of the Sera Je Food Fund. Without all of you, this incredible offering would not be possible. Thank you so much! Lama Zopa Rinpoche’s 2010 teachings from Singapore are now on the Online Learning Center. These teachings were the start of the ongoing Lama Tsongkhapa Guru Yoga commentary. Some restrictions to the teachings apply as outlined on the OLC. The upcoming 2011 teachings that will begin in February will also be made available on the Online Learning Center soon after the teachings have concluded. Watch this space! Le Module 14 de Découverte du bouddhisme, Expériences spécifiques d’intégration, est librement accessible en ligne en français. Les centres sont invités à envoyer à Merry les dates de leurs prochaines retraites de DB (dont les nyoung-nès) afin de les ajouter à la page emploi du temps : nos étudiants en ligne cherchent des groupes pour leurs retraites du Module 14. Merci ! Lama Tsongkhapa Prayer Flag: This beautiful prayer flag was designed by Lama Zopa Rinpoche and took three years to complete. In 2007, Lama Zopa Rinpoche recommended all FPMT centers, projects and services to fly this (and the Gyaltsen Tsemoi Phugen prayer flag) for auspiciousness and protection. The prayers on the flag include the Refuge Prayer, the Prayer for the Flourishing of Lama Tsongkhapa‘s Teachings, the prayer Accomplishing the Auspiciousness which includes prayers to the Five Dhyani Buddhas, Lama Tsongkhapa‘s Prayer, dedication prayers, and prayers to avert war, earthquakes, and natural disasters in this universe and especially in the places that the flag is flown. The flag measures 56″ (1.42 meters) by 60″ (1.52 meters) and is now on sale! Check out the Lama Tsongkhapa prayer flag and the Gyaltsen Tsemoi Phugen prayer flag. The prayer flag of Gyaltsen Tsemoi Phugen removes obstacles and promotes harmony. Read the latest Foundation Store newsletter for other new product arrivals and monthly specials. A heartfelt thank you to everyone who has submitted their International Merit Box Project donation for 2010. There is still time to send in your donation before collection ends on March 31. You may make a credit card donation though the Virtual Merit Box or see our collection information page for more options. By becoming a Friend of FPMT you can stay connected to all that FPMT has to offer including Mandala Publications, the FPMT Online Learning Center and various complimentary resources offered at the free FPMT Membership level. We’re confident we’ve designed a level that is perfect for your budget, studies and practice. Essential reading – updated advice from Rinpoche on the importance of getting your logo right. “The logo is not just a design of your company, or something to identify with – thinking in this way has no meaning, and it is very uninteresting, boring. NB: If your center, project or service has a logo designed by Rinpoche, please send a good-quality JPEG copy to Claire for reference and for our archive. I hope everyone already received our overview of these updates and has read all the information posted in the FPMT Affiliates Area. If you didn’t receive this information or have any questions, please let Claire know. We have recently updated this webpage to highlight the lamas who have kindly accepted Lama Zopa Rinpoche’s request to support his Dharma work by being available to travel to teach at FPMT centers, projects and services. Directors and spiritual program coordinators who would like to invite these lamas can find contact information in the FPMT Affiliates Area. At International Office we selected some classic quotes of Rinpoche and made them into beautiful posters which we hung around the office. At the last FPMT, Inc. board meeting Rinpoche commented that he liked them, and advised that we make them available for centers, projects and services. You can download them from the FPMT Affiliates Area, or soon from the Foundation Store as free downloads on the FPMT Centers Only page. We are accepting applications for International Merit Box Projects grants until February 28, 2011. Any center, project, service or study group that has an eligible project may e-mail meritbox@fpmt.org to request an application form. If you are a Foundational or In-Depth FPMT-registered teacher, you may be interested in these two opportunities: Tushita Meditation Centre in Dharamsala, India needs a resident teacher (for more information go to Volunteer and Job Opportunities) and Root Institute in Bodhgaya, India is looking for teachers to be part of the teacher team for a new 10-day residential course, “Experience Buddhism at the Root,” a unique offering from Root Institute in conjunction with FPMT Education Services. For more information, contact Ven. 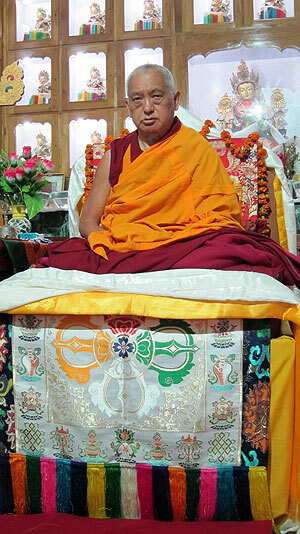 Thubten Labdron by February 28, 2011. Lama Zopa Rinpoche with Domo Geshe Rinpoche in Kalimpong, December 2010. Tushita Mahayana Meditation Centre hosted the 30th Delhi Dharma Celebration with His Holiness the Dalai Lama – there were 3,000 people in attendance! The event went very well and His Holiness seemed very relaxed. His Holiness talked on the different levels of happiness. And Choe Khor Sum Ling in Bangalore hosted a public talk with His Holiness, which was live-streamed on the Online Learning Center. Thubten Norbu Ling in New Mexico, USA is looking for a new director; Root Institute’s project, the Shakyamuni Buddha Community Health Care Centre is looking for a nurse; and the Land of Joy, a new project starting in the UK, is looking for a PR Coordinator. Since the I that exists is merely imputed, there is nothing to cherish, nothing to cling to. Good-bye to depression, worries and fears.